If I were to become a deer, and live in forest picking and eating fruits and roots. By Guru’s grace, I would still meet my Master whom I would sacrifice all my self. I am a dealer of God’s Name. His meditation is my merchandise. If I were to become a cuckoo living in a mango tree, I would still contemplate on God’s Name. I would still meet my Master, with natural ease and have His blessed beautiful darshan. If I were to become a fish, living in water, I would still remember the Lord, who watches over all beings and creatures. My husband Lord dwells on the other shore and I would still meet Him, and hug Him close in my embrace. If I were to become a snake, living in the ground, the Name of God would still dwell in my mind, and all my fears would be dispelled. O Nanak, they are forever the happy soul-brides, whose light merges into His Light. ਹੇ ਪ੍ਰਭੂ, ਜੇ ਤੇਰੀ ਮਿਹਰ ਹੋਵੇ ਤਾਂ ਮੈ ਤੇਰੇ ਨਾਮ ਦੀ ਵਣਜਾਰਨ ਬਣ ਜਾਵਾਂ. ਤੇਰਾ ਨਾਮ ਮੇਰਾ ਸੌਦਾ ਬਣੇ ਤੇ ਮੈ ਤੇਰੇ ਨਾਮ ਦਾ ਹੀ ਵਾਯਪਰ ਕਰਾਂ. ਜਿਵੇ ਹਰਨੀ ਜੰਗਲ ਵਿਚ ਰਹ ਕੇ ਫਲ ਫੁਲ ਖਾ ਨਿਸ਼ਚਿੰਤ ਰਿਹੰਦੀ ਹੈ, ਮੈ ਵੀ ਤੇਰੇ ਨਾਮ ਦੀ ਮਸਤੀ ਵਿਚ ਇਸ ਸੰਸਾਰ ਵਿਚ ਵਿਚਰਾਂ. ਗੁਰੂ ਦੀ ਕਿਰਪਾ ਸਦਕਾ ਮੇਰਾ ਮਲਿਕ ਮੇਨੂ ਮਿਲੇ ਤੇ ਉਸ ਉਪਰ ਵਾਰ ਵਾਰ ਅਪਨੇ ਨੂ ਕੁਰਬਾਨ ਜਾਂਵਾਂ. ਪ੍ਰਭੂ ਜੀ, ਮੈ ਤੇਰੇ ਨਾਮ ਦੀ ਵਣਜਾਰਨ ਹਾਂ ਤੇ ਤੇਰਾ ਨਾਮ ਦਾ ਹੀ ਮੈ ਵਪਾਰ ਕਰਦੀ ਹਾਂ. ਜੇ ਮੈ ਅੰਬ ਤੇ ਬੈਠੀ ਕੋਯਲ ਹੋ ਜਾਵਾਂ ਤਾਂ ਵੀ ਪਰਮਾਤਮਾ ਦੇ ਸ਼ਬਦ ਵਿਚ ਮੇਰਾ ਮਨ ਜੁੜਿਆ ਰਹੇ ਅਤੇ ਸਹਜੇ ਹੀ ਮੈਨੂ ਮੇਰੇ ਮਲਿਕ ਪ੍ਰਭੂ ਦੇ ਅਧ੍ਬੁਧ ਦਰਸ਼ਨ ਤੇ ਮਿਲਾਪ ਹੋ ਜਾਣ. ਜੇ ਮੈ ਮਛੀ ਬਣਾ, ਸਦਾ ਉਸ ਜਲ ਪ੍ਰਭੂ ਵਿਚ ਟਿਕੀ ਰਹਾਂ ਜੋ ਸਾਰੇ ਜੀਵ ਜੰਤਾਂ ਦੀ ਸਭਾਲ ਕਰਦਾ ਹੈ ਤੇ ਮੈ ਸੰਸਾਰ ਸਮੁੰਦਰ ਦੇ ਦੂਸਰੇ ਪਾਰ ਬਾਹਾਂ ਪਸਾਰ ਉਸ ਪ੍ਰਭੂ ਪ੍ਰੀਤਮ ਨੂ ਮਿਲਣ ਜਾਵਾਂ. ਜੇ ਮੈਂ ਨਾਗਨ ਹੋਵਾਂ ਤੇ ਇਸ ਧਰਤੀ ਵਿਚ ਵਾਸ ਕਰਾਂ, ਪ੍ਰਮਾਤਮਾ ਦੇ ਸ਼ਬਦ ਨੂ ਮਨ ਵਿਚ ਵਾਸ ਕਰ ਮੇਰੇ ਸਾਰੇ ਡਰ ਦੂਰ ਹੋ ਜਾਣ. ਹੇ ਨਾਨਕ, ਜਿਨਾ ਜੀਵ ਇਸਤ੍ਰੀਆ ਦੀ ਜੋਤ ਸੁਰਤ ਪ੍ਰਭੂ ਪ੍ਰਮਾਤਮਾ ਵਿਚ ਟਿਕੀ ਰਹਦੀ ਹੈ ਓਹ ਬੜੀਆ ਭਾਗਾਂ ਵਾਲੀਆਂ ਹਨ. 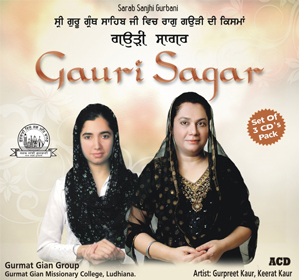 This entry was posted in Shabad Kirtan and tagged Banjaran, Gurbani Sangeet, Gurmat Gian Group, Gurmat Sangeet, Gurpreet Kaur, Japjit Kaur, Keerat Kaur, Keertan, Kirtan, Naam, Ram, Shabad, Shabad Kirtan. Bookmark the permalink. Have been listening to this Shabad as background to daily chores. I hear the harmonium in the background. Normally, I am not in favour of this instrument. However, it is most attrative in this bandash. 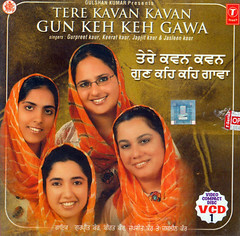 It reminds me of traditional Kirtan. 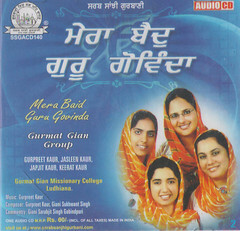 Hope the GGG Bibian can sing more shabads in this mode and also revive “puratan reets” in their own way. How sweet kirtan and how the kirtanis are blessed by waheguru ji to singh and spread his message around the world by their lovliest voices. Waheguru sada sad hai naaley, tu mere sung sada smalay. May waheguru ji keeps his irrevocable blessings to kirtanis and associates, for ever. “AAP JAPAY AWRA(n) NAAM JAPAWEY” Graet part of gursikhi, Thanks Waheguru ji. Piarey Khalsa jio! je kar tusi harshabad naal sggs (sguru granth sahib) Page/ung bhi ha shabadnaal de sako taa sanu bahut hi aasani ho jawegi achian nu shabad print ker ke den layee,So gustakhi di mafi te ho sakey taa zaroor shabad naal ung/ang(page &/or line bhi de dya karo ji. Atyant dhanwaad tuhada te guru sahib ji da. Thanks for liking the Shabad Kirtan. 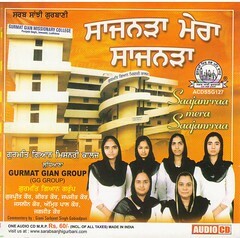 We would certainly add the Shabad Page/ung of SGGS along every Shabad. We’ll do it in a couple of days. Tuhada bahut2 dhanwaad,tusi rag de dita hai so, kaafi hai ji. Thank you for singing this shabad in such a nice way. What a gift to the Sikhs all over the world. You have wonderful voices. Please keep up with giving us many more beautiful shabads . 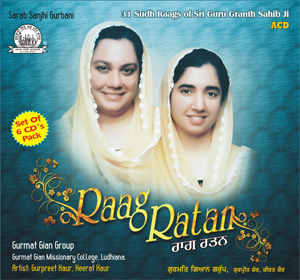 I am very grateful for giving us the opportunity to listen to Guru Sahib’s rachna. 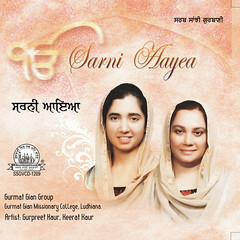 veer Sarbjit Singh ji nice wording…harmony and wisdom Gurbani sung with devotion. Thank you Gurmat Gian Group.